The administration proposes a 5 percent raise for correctional officers and legislation to allow it to impose a labor settlement on the officers’ union, the California Correctional Peace Officers Association (CCPOA). We find that the officers’ compensation levels are sufficient to allow the prisons to meet personnel needs at the present time, but we generally agree with other administration proposals to increase management control in prisons. We note that the dysfunctional relationship between the administration and CCPOA makes it more difficult to address the many issues facing the state’s prison and personnel management systems. Huge Numbers of People Are Interested in Being Correctional Officers. The successful operation of California’s vast prison system depends on the work of around 30,000 state correctional peace officers. There is a huge supply of workers interested in being one of these officers. Currently, around 130,000 applications—equivalent to one of every 140 persons in the California civilian labor force—are received by the state to be a correctional peace officer each year. The educational requirement to be a correctional officer generally is a high school diploma or the equivalent. Particularly when compared to other Californians with similar educational levels, officers enjoy substantial job security, and they earn good salaries and outstanding benefits. Salaries and benefits both were increased under the labor agreement between the state and the officers’ union that was in effect between 2001 and 2006. For all of these reasons, the job of state correctional officer may now be the most sought after in the California economy. With a reopened and expanded academy, the Department of Corrections and Rehabilitation (CDCR) recently has reported making major progress in filling correctional officer positions. Dysfunctional Relationship Between Administration and Union. The current relationship between the California Correctional Peace Officers Association (CCPOA) and the state is marked by constant, time–consuming, expensive, and, sometimes, strident conflict. It appears to be completely dysfunctional. This conflict results in scores of arbitration cases that distract CDCR and Department of Personnel Administration (DPA) staff members from tending to other issues in prisons and the broader state workforce. This conflict also manifests itself at the bargaining table, and makes it more difficult to implement prison and parole system reforms. With Talks Stalled, Administration Wants to Impose Its Plan. In September 2007, talks between DPA and CCPOA regarding a new labor agreement broke down. The administration announced its intent to invoke a rarely used provision of state law and impose its “last, best, and final offer” on CCPOA, subject to legislative approval of expenditures and any statutory changes needed to implement the offer. The plan gives officers a 5 percent raise and increased benefits in 2007–08 (at an estimated annual cost of $260 million) and institutes changes that the administration says will increase management control of the prisons, curb abuse of leave time, and reduce employee grievances. Compensation Increases Not Needed At This Time. We find little evidence that current compensation levels are insufficient to attract the number of qualified officers needed to staff California’s prisons. In addition, the state faces other pressing recruitment and retention issues in other bargaining units, as well as serious budgetary challenges. Accordingly, we recommend that the Legislature reject the administration’s current proposal to increase pay and benefits for correctional officers retroactive to July 1, 2007. The administration’s proposals to increase management control of the prisons, however, have much merit. Among the major issues facing the Legislature as it addresses policy issues concerning prisons and the state’s fiscal situation are those related to the pay, benefits, and general labor–management relations with the state’s correctional peace officers. Rank–and–file officers are represented by CCPOA. In this report, we discuss the recent history of the state’s labor relations with CCPOA and make recommendations to the Legislature concerning the Governor’s proposal to impose a new contract on the union. General information about the state’s correctional peace officers. Key provisions and the history of the last labor agreement between the state and the officers’ union. The current administration offer to the union, parts of which are being presented to the Legislature for approval. Our findings on personnel management issues affecting the officers. Our recommendations to the Legislature concerning the administration’s offer and related policy matters. In preparing this report, we discussed correctional officer personnel issues with administration representatives of DPA, CDCR, and the Department of Finance (DOF), as well as representatives of CCPOA. Their Salaries Are Largest Share of General Fund Personnel Costs. Bargaining Unit 6 is the second largest of 21 bargaining units now recognized under the state collective bargaining law (known as the Ralph C. Dills Act). Unit 6 has around 30,000 rank–and–file members. This represents one of every seven state employees. As shown in Figure 1, however, salaries and related expenses for Unit 6 members and their supervisors total about 40 percent of all such dollars paid from the General Fund. (Unit 1, representing administrative professionals, is the state’s largest bargaining unit and accounts for the General Fund’s second largest expenditures.) This figure results from the relatively high salary levels of correctional officers, as well as the fact that personnel costs for correctional staff—unlike many other groups of state employees—are funded almost entirely from the General Fund. The CCPOA represents Unit 6 members in their employer/employee relationships, including labor negotiations. Correctional Officers Oversee Felons and Youth Offenders. About 80 percent of Unit 6 members belong to the civil service classification of correctional officer (the largest such class in state government). These officers confine and supervise felons within the state’s prison system. Specific duties vary among institutions and designated posts based on security levels of inmates, facility design, and assignments. Officers are assigned to duty in towers, housing units, prison reception centers, control booths, yards, gun posts, transportation, and other prison settings. In addition to correctional officers, there are several other classifications in Unit 6. These include youth correctional officers (who supervise youth offenders), parole agents, and correctional counselors (who perform various duties, such as classification of inmates). Over 200 Unit 6 members work for the Department of Mental Health (DMH), where they provide custody and treatment services for inmate/patients at DMH facilities. The rest work in CDCR. Unit 6 members and their supervisors make up over one–half of CDCR’s workforce. 2001–2006 Labor Agreement. Unit 6’s last labor agreement with the state—known as a memorandum of understanding (MOU)—instituted major changes in correctional officer personnel policy (salaries, benefits, and other personnel matters) and, therefore, in prison system operations. Chapter 1, Statutes of 2002 (SB 65, Burton), which ratified this MOU, took effect on January 16, 2002, although certain provisions of the MOU were retroactive to July 1, 2001. The agreement expired on July 2, 2006. (Accordingly, the MOU is known as the 2001–06 MOU.) The five–year duration of the agreement was unusual, but under the Dills Act, the Legislature has the choice whether to fully fund or not to fully fund expenditures under an MOU in the annual budget act. (If the Legislature opts not to fully fund such expenditures, the Dills Act provides that negotiations may reopen on all or part of the MOU.) As discussed below, the prior CCPOA MOU was renegotiated in 2004. The 2001–06 CCPOA MOU is over 400 pages long. It contains many substantive provisions. Key provisions are summarized in Figure 2 and discussed below.  Salaries. Linked correctional officer and CHP officer salaries. - No pay increases in 2001‑02 and 2002‑03. within $666 per month of CHP officers’ compensation by 2006.
officers who retire in 2006 or after. to officers. Other provisions increased overtime compensation of officers.  Salaries and Benefits. Deferred salary and benefit increases to later years of the agreement. fiscal years: 2004‑05 and 2005‑06. officers with renegotiated compensation amounts through July 2, 2006. Relationship Between Correctional and Highway Patrol Salaries. The original version of the MOU, as ratified by the Legislature in 2002, provided for salary increases on four specific dates: July 1 of each of the years 2003, 2004, 2005, and 2006. The salary increases were to be based on “a law enforcement comparative methodology mutually agreed to by the parties.” Described in a document labeled as an “unpublished side letter” (an agreement signed by officials of DPA and CCPOA), this methodology linked correctional officer pay to that of CHP officers, which in turn had been linked to that of the five police departments since 1974. The unpublished side letter listed a complicated formula involving the base pay and several other categories of compensation of both Unit 6 members and CHP officers. The results of the formula showed that correctional peace officers were paid $666 per month less than comparable CHP officers as of June 2001. As a part of the MOU, CCPOA agreed to forego salary increases for the first two years of the agreement. The subsequent salary increases were structured to bring the compensation of Unit 6 members—as defined in the unpublished side letter—back to within $666 per month of comparable CHP officers by the MOU’s expiration date in 2006. Along with ratifying the 2001–06 MOU, Chapter 1 made another important change to state employee salaries—effectively requiring the state (except upon mutual agreement with the CHP officers’ union) to pay CHP officers each year in line with the pay given to comparable officers of the five urban police departments listed earlier. Previously, the law required only that DPA consider local pay in this manner. “3 Percent at 50” Retirement Benefits. Chapter 1 implemented increases in correctional officers’ retirement benefits on top of other increases that were approved several years earlier. Prior to 2000, retiring correctional officers were eligible for 2.5 percent at 55 retirement benefits through the California Public Employees’ Retirement System (CalPERS)—funded from both employer and employee contributions. Chapter 555, Statutes of 1999 (SB 400, Ortiz), increased various categories of CalPERS pension benefits, including an increase in correctional officers’ benefits from the 2.5 percent at 55 formula to a “3 percent at 55” formula. In 2002, Chapter 1 further increased the benefits from the “3 percent at 55” formula to a “3 percent at 50” formula for officers who retire in 2006 or thereafter. This means that an officer retiring at or after age 50 is eligible for a pension equal to 3 percent of final compensation multiplied by his or her number of years of service. Maximum pension benefits typically are 90 percent of final compensation. In addition to its contributions for the CalPERS benefits, the state makes contributions to a defined contribution retirement plan for correctional officers equal to about 2 percent of each eligible union member’s base pay. Reduced Work Period. The federal Fair Labor Standards Act (FLSA) and its regulations include rules about overtime wages. Generally, overtime must be paid at 150 percent of the employee’s regular rate of pay for each hour worked over 160 hours in a 28–day work period (essentially, each hour over a 40–hour work week). There are specific FLSA rules for law enforcement officers, including correctional officers. In 2002, Davis Administration officials stated that FLSA “permits an exception for law enforcement personnel but only if the employees’ union agrees.” In its 1999–2001 labor agreement, Unit 6 agreed to be paid overtime after working 168 hours each 28 days (160 hours of regular post duty, 4 hours of pre– and post–shift activities, and 4 hours of training). The 2001–06 MOU, however, changed that provision, effective July 1, 2004, to one where officers would receive overtime after working 164 hours (excluding the 4–hour training requirement) every 28 days. Because officers’ posts need to be covered while they are attending training, this led to increased overtime costs (estimated by the Bureau of State Audits to be at least $38 million annually beginning in 2004–05). The administration stated in 2002 that this was cheaper than having no FLSA exemption at all from CCPOA. Sick Leave and Overtime. As we discussed in our Analysis of the 2000–01 Budget Bill (see page D–51), CDCR has had problems managing the use of sick leave by its employees. The 2001–06 MOU eliminated a program that institutions previously used to track and identify sick leave use. In addition, a provision of the CCPOA MOU included sick leave as time worked in calculating overtime. Moreover, the MOU assigned overtime by seniority, meaning that the most senior—and, therefore, the most highly paid—employees were able to work more overtime. Since overtime compensation is based on the employee’s base salary, these provisions increased CDCR overtime costs. Other factors, including unfilled officer positions and institution–specific factors, also have contributed to CDCR’s recurring, high overtime expenditures. Unit 6 members accounted for $471 million of overtime costs in 2006–07—an average of over $16,000 per Unit 6 member. This was an increase from $402 million of overtime costs in 2005–06, a 17 percent increase in one year. The subject matter of the change is within the scope of representation for the union under state law. The union requests to negotiate with the state. The clause provides that if there is a disagreement on whether a proposed change is subject to negotiation, that disagreement may be submitted to binding arbitration. The Schwarzenegger Administration has stated that CCPOA’s use of this clause “requires the state employer to negotiate continuously with CCPOA over the impact of matters within its management discretion.” The administration also has cited the clause as one reason for a backlog of over 550 pending arbitrations related to CCPOA as of September 2007. In 2003 and 2004, the current and prior administrations sought various concessions from state employee unions in order to help address the state’s fiscal problems. Chapter 217, Statutes of 2004 (SB 1110, Cedillo), approved a renegotiated agreement with CCPOA. Chapter 217 was estimated to result in $108 million of reduced General Fund costs over two fiscal years: 2004–05 and 2005–06. Continuous Appropriation. Under the Dills Act, increases to cover higher costs for unionized state employees’ pay and benefits typically require approval by the Legislature each year in the budget act. Chapter 217, however, continuously appropriated the funds necessary to provide Unit 6 members with the compensation amounts specified in the renegotiated MOU through July 2, 2006. Large Arbitration Award Increases Officers’ Pay Levels Beginning in 2007. In 2005, CCPOA filed a grievance concerning several issues, including the amount of the July 1, 2005 pay increase calculated by the administration under the MOUs’ comparative pay methodology. In November 2006, an arbitrator found in favor of CCPOA on several of the points in the arbitration, resulting in a total award of $440 million. (The $440 million cost figure included  the cost of retroactive increases in officers’ compensation levels for 2005–06 and 2006–07 and  the ongoing cost of the increases in 2007–08.) The Legislature appropriated funds to comply with the arbitrator’s decision. Unit 6 members’ paychecks generally reflected these increases beginning in the spring of 2007. No Required CCPOA Pay Increases After 2001–06 MOU Expires. In 2006, the Legislature approved a new four–year MOU with the CHP officers’ union, to take effect July 3, 2006. The 2001–06 CCPOA MOU expired the day before. In September 2006, CCPOA filed a grievance asserting that Unit 6 members’ pay needed to be adjusted to maintain the $666 monthly difference with CHP officers, even though the MOU with the state had expired. In September 2007, an arbitrator found “there is no requirement in the MOU to provide additional salary increases to CCPOA” due to increases in CHP officers’ compensation after July 2, 2006. Unit 6 Pay Climbed Much Faster Than That of Other Employees. Most state employees, including Unit 6 members, received no general salary increase in 2001–02 or 2002–03. Figure 3 shows the general salary increases for correctional officers, CHP officers, and most other state employees between 2003–04 and 2007–08. We estimate that the 2001–06 MOU resulted in correctional officers receiving general salary increases of about 34 percent over this period, not including merit salary increases, overtime, and other categories of compensation. These salary increases were more than twice as much as the increases for the average state employee over the same period. a Includes 3.1 percent pay raise—retroactive to 2005-06—awarded to correctional officers as a result of a November 2006 arbitration decision. b Includes 0.9 percent increase starting June 30, 2006 and a 4.3 percent increase starting July 1, 2006.
c Proposed increase based on administration’s “last, best, and final offer” to officers’ union. pre- and post-shift activities that are compensable under federal law. Major Difficulties in the Administration’s Relationship With the Union. Despite the significant compensation increases for Unit 6 members, relations between the administration and CCPOA appear to have soured significantly in recent years, as described in the text box on the next page. This poor relationship manifests itself at the bargaining table. Several accounts suggest that when DPA and CCPOA negotiators met to discuss a new MOU during 2006 and 2007, little—if any—progress was made in reaching agreement. Conflict Distracts Officials and Hampers Effectiveness of Government. In reviewing correctional officer personnel matters, we have been struck by the negative tone of the relationship between the leadership of the correctional officers’ union and the administration. Union leaders regularly question administration officials’ honesty and competence. Administration officials were unable to stimulate a productive discussion with the union to secure a successor agreement to the 2001–06 memorandum of understanding (MOU). Given the significant challenges facing California’s prison system, this unproductive relationship hurts the state. Bad labor relations make it more difficult to operate the California Department of Corrections and Rehabilitation (CDCR). Grievances and arbitrations proliferate. Attention to the large backlog of personnel matters and difficult contract negotiations distracts CDCR, Department of Personnel Administration, and other officials from tending to other major issues in the prison system and problems affecting the rest of the state workforce. What Can the Legislature Do? The Legislature has broad, formal powers to address labor/management issues. It created the Dills Act, which established that negotiated MOUs would be a key vehicle for setting state personnel policy and gave state employee unions the privileges and responsibilities that they have today. Before or after an MOU expires, the Legislature may approve whatever pay and benefit changes it deems necessary. Still, fixing the relationship between a union and the executive branch is difficult. Beyond their formal powers to legislate and conduct oversight, Members of the Legislature probably will need to use their abilities to persuade in order to convince both the administration and union officials to move to common ground. Incomplete Information on the Administration’s Offer. Talks between DPA and CCPOA on a new MOU broke down in September 2007. The administration now proposes that the Legislature approve funds needed to impose parts of its last, best, and final offer to the union. In addition, administration officials have stated that they will ask the Legislature to approve statutory changes to implement parts of this offer. (As of the date this report was written, we had not seen the text of these statutory proposals.) Figure 4 lists key provisions of the administration’s offer.  Increase salaries 5 percent, retroactive to July 1, 2007.  Increase state contributions to officers' health premiums in 2008.  New bonus payment for officers who recruit a person who subsequently graduates from the academy.  Increase recruitment and retention payments for officers at several institutions.  Increase pay for officers who work night and weekend shifts.  Increase uniform allowance for officers.  Reinstate parts of sick leave management program eliminated by prior agreement.  More flexibility for department to assign personnel.  Change grievance and arbitration procedures. When the administration presented CCPOA with its last, best, and final offer, DPA notified the Legislature and posted the hundreds of sections of its offer on its Web site. The sections contain strikethroughs in the text denoting changes from the prior agreement or prior administration offers. In addition, DPA posted a list of the selected parts of its last, best, and final offer that it was choosing to implement under the Dills Act. This display is confusing due to the lack of a single, authoritative, easy–to–read document listing all parts of the offer that the administration plans to implement. In addition, statutory changes to implement the offer have not been identified for the Legislature. We still have many questions about what exactly the administration’s offer means. Given these uncertainties, we rely principally on the administration’s summaries of its offer in describing its provisions below. Salaries. In September 2007, the administration announced its intent to implement 5 percent annual salary increases for all Unit 6 members, effective on July 1 of the years 2007, 2008, 2009, subject to legislative approval. In December 2007, Public Employment Relations Board (PERB) staff announced that it agreed with a CCPOA complaint that the state’s implementation of the last, best, and final offer over a full three–year period (rather than a single year) would violate the state collective bargaining law—apparently by signaling that the state was no longer negotiating in good faith with the union. Following the PERB staff’s announcement, DPA modified its salary and other proposals and announced the administration’s intent to seek their implementation for only one year at a time. Accordingly, the administration has requested legislative approval for a 5 percent salary increase for correctional officers retroactive to July 1, 2007. Health Benefits. Under the arbitrator’s November 2006 decision, Unit 6 members received state contributions to their CalPERS health premiums during the latter years of the 2001–06 MOU equal to 85 percent of the weighted average employee premium costs of the four largest state employee health plans and 80 percent of the additional average premium costs needed to cover employee’s eligible dependents. (This is called the “85/80 formula.”) Because CalPERS premiums increase each year, additional legislative appropriations generally are required to maintain benefits pursuant to the 85/80 formula. The administration proposes that the state make health contributions for Unit 6 members equivalent to the 85/80 formula in 2008, effective in the pay period following approval of enabling legislation. Other Compensation Increases. The administration’s offer would increase several other categories of officers’ compensation. The offer contains several measures to improve recruitment and retention. It proposes implementation of a pilot program to provide a $2,000 bonus payment to Unit 6 employees who recruit a new correctional officer or youth correctional officer who subsequently graduates from the academy. The offer also would increase existing recruitment and retention incentives for correctional officers at certain institutions. In addition, it would increase night shift and weekend shift differentials for officers, as well as their uniform allowances. In general, the non–fiscal components of the administration’s offer seek to increase managers’ control over prison personnel policies. Sick Leave. In September 2007, the administration announced that it would implement the parts of its offer that reinstate elements of the sick leave management program eliminated by the 2001–06 MOU. The department would be able to examine the frequency and use of sick leave and take corrective or disciplinary action against abusers. The administration’s offer eliminates the use of sick leave as “time worked” for purposes of calculating overtime, subject to legislative approval. More Flexibility in Assigning Personnel. The offer would change “post and bid procedures” and policies concerning employee–requested transfers, generally allowing management additional flexibility in assigning employees. As described elsewhere in this report, CDCR has reported making progress in increasing correctional staffing. Officials have requested the increased flexibility in managing employee–requested transfers by noting the continued high vacancy rates in certain CDCR institutions. Some such institutions reportedly are shunned by employees as long–term assignments. Grievance and Arbitration Procedures. The administration has proposed changes that it believes would simplify grievance and arbitration procedures, clarify the authority of arbitrators, and clamp down on what it perceives as abuses of the process. In a letter to Unit 6 members in September 2007, administration officials said that under the terms of the last, best, and final offer it was implementing, grievances on provisions of the expired MOU were impermissible, but grievances on “CDCR/DMH policies and health and safety matters” would “continue to be processed.” Further, the letter stated that grievances filed on or after September 18, 2007 will not go to arbitration. We review the administration’s pay and benefit offer and key issues related to correctional officers below. Administration Cost Estimate for 2007–08 Would Be Slightly High. The administration has proposed that the Legislature approve $260 million of additional 2007–08 expenditures to cover costs of its proposed pay and benefit increases for correctional officers, as well as their supervisors and managers. If the Legislature were to approve the proposal, this estimate of the cost of the administration’s offer in 2007–08 would be slightly high. It assumes that health benefit cost increases for Unit 6 members take effect on January 1, 2008, while the administration’s summary of its offer makes clear the benefit increase would take effect on the first day of the pay period following approval of the enabling legislation by the Legislature. This would reduce the cost estimate by a few million dollars per month after January 1 until approval. Cost Estimates Do Not Explicitly Address Several Categories of Possible Costs. Consistent with DPA‘s usual practice in estimating the cost of employee pay increases, the administration’s estimate of the costs of its CCPOA offer do not address overtime costs explicitly. One goal of the administration’s plan, however, is a reduction of overtime costs. If CDCR successfully reduces overtime hours, it is possible that the costs of the offer would be less than estimated by the administration in 2008–09 and future years. Should CDCR be unable to reduce overtime usage under the plan, however, each hour of overtime worked would cost more due to the base pay increase. Tens of millions of dollars of unbudgeted cost increases could result. 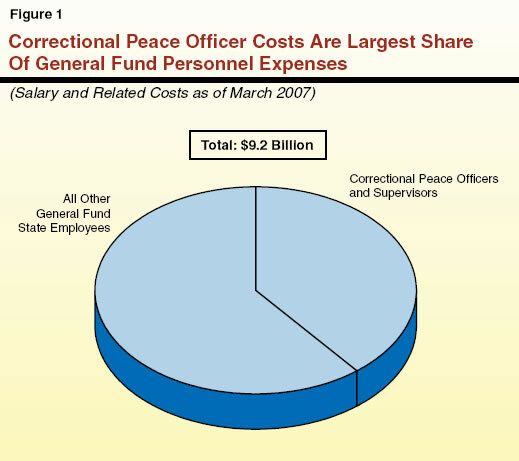 In addition, in previous cost estimates (before the administration withdrew the second and third years of its offer in response to the PERB complaint), DPA did not address possible increases in overall correctional staffing costs that may result in future years from (1) actions of the Receiver or (2) new prison facilities authorized by Chapter 7, Statutes of 2007 (AB 900, Solorio). Most of these costs would materialize for the state under current law, regardless of the Legislature’s actions concerning the last, best, and final offer. Administration’s Prisoner Release Plan Would Reduce Ongoing Costs. The Governor’s budget estimates that the reduction in CDCR staffing resulting from the administration’s plan to release certain non–violent inmates would reduce the ongoing costs of its proposed 2007–08 pay increases by $30 million per year beginning in 2008–09. The ability to achieve this savings would depend on the administration’s success in implementing the release plan. We will address this proposal in further detail in our Analysis of the 2008–09 Budget Bill, which will be released on February 20, 2008. Potentially Large Added Costs in the Future, if Union Prevails. The state and CCPOA are involved in several disputes that could lead to increased state costs in the future. In the months since talks broke down between the union and DPA, CCPOA’s public statements have hinted that the union may pursue litigation against the state related to federal and state labor laws. This litigation—particularly cases related to federal laws on wages, hours, work breaks, and other labor law exemptions the union agreed to provide to the state in the past—may proceed regardless of the Legislature’s action on the administration’s offer. The potential state liability could be in the hundreds of millions of dollars annually. While the Legislature has the power to change state labor laws prospectively to reduce these risks, it has limited power to affect implementation of federal labor laws. High Vacancy Rates Have Been an Issue. The 1986 statute on correctional officer compensation cited difficulties in recruiting and retaining correctional officers. In recent years, CDCR’s inability to fill authorized correctional officer positions—resulting in widespread vacancies—has been a major issue. When there are significant vacancies, prison overtime costs often increase, and working conditions may deteriorate. Significant Increase in Resources for Recruitment and Training. In the last several years, the Legislature has appropriated tens of millions of dollars to reopen CDCR’s basic correctional officer academy after it was deactivated in 2004, expand the academy, and increase the budget of CDCR’s Office of Peace Officer Selection (OPOS). Department Reports Major Progress in Hiring Efforts. Recently, the administration has reported making significant progress in increasing correctional officer staffing. In a November 2007 report to the Legislature, CDCR reported that it was on track to graduate about 1,575 graduates from its correctional officer academies between July 2007 and December 2007. In this report, the department projected that officer attrition during these months would total just over 600. Accordingly, the net expected increase in correctional officer staffing was about 1,000 over this period. The CDCR estimated that its vacancies would decline from about 2,800 at the beginning of 2007–08 to about 1,800 by the end of calendar year 2007 (including estimates of what CDCR terms its “unbudgeted positions” for correctional officers, such as positions for emergency population issues). The department reports that further reductions in vacancies appear likely in 2008. Other Data Backs up the Department’s Claims. Due to different data systems and definitions of positions, personnel data from various sources—such as departments and the State Controller’s Office (SCO)—generally do not match exactly. Data from SCO, however, have shown a general trend during the past year of increasing staffing levels and declining vacancy rates—similar to the data reported by CDCR. The Evidence Suggests the Department Is Making Progress. There have been disagreements about how to calculate the exact number of officer vacancies. Representatives of the union sometimes merge the issues of vacant positions and overtime, reasoning that a significant portion of overtime hours worked by officers results from there being insufficient authorized levels of staffing. This approach suggests a higher number of vacancies at any time. We do not mean to suggest that CDCR has solved its vacancy problem. Rather, after examining data presented from various sources and considering the track record of CDCR in filling its recent correctional officer academy classes, we note the department’s success in expanding staffing at a time when prisoner population is essentially flat. Especially given the complex, lengthy, and sometimes confusing hiring process of CDCR and other state departments—described in the nearby text box—the department’s progress in hiring officers is noteworthy. More work on reducing vacancies may be needed (especially if population levels remain stable or increase), but no matter how one defines the vacancy problem, the department’s hiring success helps to address it. Additional Focus on Prisons With High Vacancies May Be Needed. Officials told us that OPOS prioritizes processing of applicants willing to serve in “critical needs” prisons—those with a 10 percent or higher vacancy rate. When CDCR presented us with information on the institutional assignments given to graduates of three recent correctional officer academy classes, however, the data showed that a majority of these graduates—51 percent—were assigned to noncritical needs institutions. (At least some of these assignments appear to have been directly or indirectly related to requests from the Receiver for correctional officer staff related to prison medical care.) Additional efforts to assign academy graduates to the critical needs institutions may be needed to reduce their vacancy rates and to sustain a lower level of vacancies over time. Average Applicant Processing Time Said to Be Six Months. The Office of Peace Officer Selection in the California Department of Corrections and Rehabilitation (CDCR) processes around 10,000 applications per month. About 60 percent of applicants actually proceed to the correctional officer employment examination. About 4 percent of initial applicants eventually proceed to the correctional officer academy. According to CDCR, the average correctional peace officer applicant processing time is about six months. The CDCR reports that applicants agreeing to be assigned to critical needs institutions with significant vacancies currently are processed first, and, therefore, other applicants may experience longer processing times. Background investigations and preemployment medical screenings have been blamed for much of the time required, and the Legislature has appropriated additional resources to assist CDCR and the State Personnel Board in reducing these delays. Nevertheless, these processes remain quite complicated and lengthy, undoubtedly discouraging many qualified applicants from completing the process and discouraging still others from applying in the first place. By decreasing the pool of applicants, the slow process may unnecessarily increase compensation pressures. Work Needs to Continue to Streamline Process. In today’s job environment, a hiring process that takes six months or more is anachronistic. Such a hiring process—particularly a lengthy one like CDCR’s that is confusing and complicated to many applicants—puts the state at a distinct disadvantage compared with other employers. The length and complexity of the hiring process, however, is not a problem isolated to CDCR. It is a statewide issue that the administration has proposed addressing over the next decade through its Human Resources Modernization Project. Many Issues Contribute to CDCR’s Overtime Problem. In our Analysis of the 2004–05 Budget Bill (see page D–58), we discussed CDCR’s large overtime costs, the major portion of which was driven by correctional peace officer overtime. We found that high correctional officer vacancy rates at some institutions contributed to the growth of CDCR’s overtime expenses. Recent data confirms this. When we examined 2006–07 personnel data, for example, we found that institutions with higher vacancy rates tended, on average, to spend more on overtime per correctional officer. Yet, consistent with other findings we made in the 2004–05 Analysis, not all institutions follow this trend. This is because there are many other factors that drive overtime costs beyond than correctional officer vacancies. These include institution–specific factors (such as custody levels and assault incidents). Overtime Is Going up—Not Down. Despite the success that the administration reports in reducing correctional officer vacancies, overtime expenditures for Unit 6 members have continued to go up—at least through the end of 2006–07. Data from SCO indicate that overtime expenditures for Unit 6 members increased from $402 million in 2005–06 to $471 million in 2006–07. Increased base wages—which drive the hourly pay rate for employees working overtime—contributed to this increase, but many other factors probably contributed to the trend as well, as discussed above. For example, medical guarding and other costs resulting from actions of the Receiver also have been significant. The data suggest that there was not a strong relationship between (1) institutions with increased correctional officer staffing during 2006–07 and (2) declining overtime. Correctional officer staffing increased at nearly all major CDCR facilities, and the majority of facilities also reported increased overtime costs. Correctional Officer Pay and Benefit Levels Are Very Attractive. In its successful advertising campaign to recruit entry–level correctional officers, CDCR says that the job “has been called ‘the greatest entry level job in California’—and for good reason.” “Along with the great salary,” one of CDCR’s ads notes, “our peace officers earn a retirement package you just can’t find in private industry.” Some ads proclaim that “you can earn more than $73,000 a year wearing one of our uniforms.” While entry–level base salaries are much less than this (as little as $3,774 per month, not including pay differentials, overtime, or benefits), overall compensation levels for correctional officers appear to be very attractive. This is particularly true when considering that educational requirements for most classifications of correctional peace officers consist of the equivalent to completion of the 12th grade—for example, a high school diploma or passing the General Education Development test. Jobs offering comparable pay and benefits often require college–level educations. Recently, about 80 percent of correctional officer cadets have had only a high school education and/or no postsecondary degree. Little Evidence That Officer Compensation Is Too Low. For any particular job classification, the “target” public employee compensation level (including pay, health benefits, retirement benefits, and other benefits) should be the minimum amount necessary to attract enough qualified labor to fill authorized positions. With the administration reporting that it is filling academy classes and graduating cadets much faster than officers are leaving CDCR, it appears that current compensation levels for correctional officers are at least sufficient, if not more than sufficient, to fill authorized positions. Should the Legislature approve the administration’s proposals to cut CDCR’s budget by reducing the inmate population and staffing, the labor market situation may tip even more in CDCR’s favor. With less need for the state to fill officer positions after a population reduction, there may be even less pressure for higher salaries and benefits. On the other hand, if AB 900 prison construction or actions of the Receiver result in the need to hire additional officers, new pressures could emerge for higher compensation for officers in the future. Figure 5 summarizes our recommendations concerning the administration’s offer to CCPOA and related issues. Each is discussed further below.  Do not reinstate the correctional officer autopilot pay formula.  Do not increase officer compensation in 2007-08.  Approve measures to increase managerial control.  Take steps to curb authority of arbitrators.  Hold hearings on the administration's offer and any future Unit 6 labor agreement.  Require publicly accessible reporting by CDCR on key personnel issues. We agree with the administration that the comparative pay methodology in the 2001–06 MOU—linking correctional officers’ pay levels to those of CHP officers and local law enforcement—should not be reinstated. We discussed this general recommendation to the Legislature in The 2007–08 Budget: Perspectives and Issues (P&I). “Autopilot” formulas should not drive state employee compensation levels. Instead, employee compensation levels should be those needed to attract a sufficient number of qualified workers that allow departments to operate in a cost–efficient manner. We find little evidence that correctional officer salaries are currently too low to allow the state to meet its staffing needs. In fact, with significant numbers of correctional officers graduating from CDCR’s academy and officer staffing levels increasing, the data suggest that current compensation levels are sufficient, if not more than sufficient, for the state to meet its staffing needs. Accordingly, we recommend that the Legislature approve no increases in compensation for Unit 6 members during 2007–08. If the Legislature rejects all of the administration’s proposed pay, recruitment differential, and health benefit increases for 2007–08, this would result in $260 million of reduced state costs in 2007–08 and a similar amount in 2008–09, compared to the estimates included in the 2008–09 Governor’s budget. In general, the administration’s proposals to reduce sick leave abuse, enhance CDCR’s authority to assign personnel as needed, and streamline grievance and arbitration processes are sound. We generally agree with the administration’s point of view that improving the operations of the prison system requires a stronger degree of managerial control. Strong managerial authority will be necessary to implement prison and parole system reforms, address orders of the Receiver and the courts, contain overtime expenses, reduce any sick leave abuse that may persist in the department, and operate CDCR in a cost–efficient manner. We recommend that the Legislature approve measures to implement parts of the administration’s offer that accomplish these general goals. We reiterate our recommendation in the 2007–08 P&I that the Legislature amend the Dills Act or the state’s arbitration laws to limit the authority of labor arbitrators to order large payments without prior legislative approval. While most arbitration decisions interpreting MOUs and other personnel policies result in minor costs for state departments, the November 2006 CCPOA arbitration was a notable exception. As we discussed in the P&I (see page 180), the arbitrator’s decision relied on information not available to the Legislature at the time it approved the 2001–06 MOU. Accordingly, the power of arbitrators—even under the administration’s proposal—would still appear to undermine legislative authority. In the P&I (see page 187), we recommended that the Legislature convene joint hearings with members of policy and fiscal committees to consider the ramifications of certain proposed MOUs prior to approving or rejecting the labor agreements. We recommend that the Legislature hold similar hearings on the administration’s proposed last, best, and final offer. We recommend that the Legislature question both the administration and CCPOA leaders to determine what, if any, sections of state and federal labor law might be affected by the administration’s offer and the viability of the administration’s proposals to address these issues. Should the Legislature approve part or all of the administration’s proposal, implementing legislation should be carefully drafted to minimize potential risks to the state concerning any possible conflicts with state and federal labor law. We recommend that the Legislature require CDCR to post regular updates to its Web site on its hiring, correctional officer vacancy rates, and overtime usage at each institution (including overtime usage by Unit 6 members and other employees). Union leaders and others often question the accuracy of such data from CDCR. Posting the information clearly on a Web site would provide the Legislature, CCPOA, and the public an opportunity to examine data and raise questions. In the future, this information may prove valuable to the Legislature in determining when pay and benefits for correctional officers need to be increased and by how much. Correctional peace officers play an essential role in the daily operations of the prisons, and their pay and benefits represent a significant part of the state’s General Fund spending. Accordingly, we recommend that the Legislature take an active role in addressing various issues concerning correctional officers’ pay, benefits, and labor relations. With the administration and CCPOA in conflict, Members of the Legislature will need to use their abilities to persuade in order to convince both sides to move to common ground. AcknowledgmentsThis report was prepared by Jason Dickerson and reviewed by Michael Cohen. The Legislative Analyst's Office (LAO) is a nonpartisan office which provides fiscal and policy information and advice to the Legislature. LAO PublicationsTo request publications call (916) 445-4656. This report and others, as well as an E-mail subscription service, are available on the LAO's Internet site at www.lao.ca.gov. The LAO is located at 925 L Street, Suite 1000, Sacramento, CA 95814.